Have you heard of flower looms? I hadn’t until I read Crochet Loom Blooms by Haafner Linssen and now I’m hooked! If you’re looking for a new yarn craft or you’re bored with basic crochet, you need to have a look at this book. Keep reading to find out why! Before You Begin – Information about flower looms and how to use them as well as basic crochet stitches. Flower Selector – Images of all the flowers you will find instructions for in the book. Flower Patterns – 30 flower motifs with detailed written instructions and charts of how to make them. Projects – Instructions on how to turn your flowers into projects such as scarves, potholders, bags and blankets. 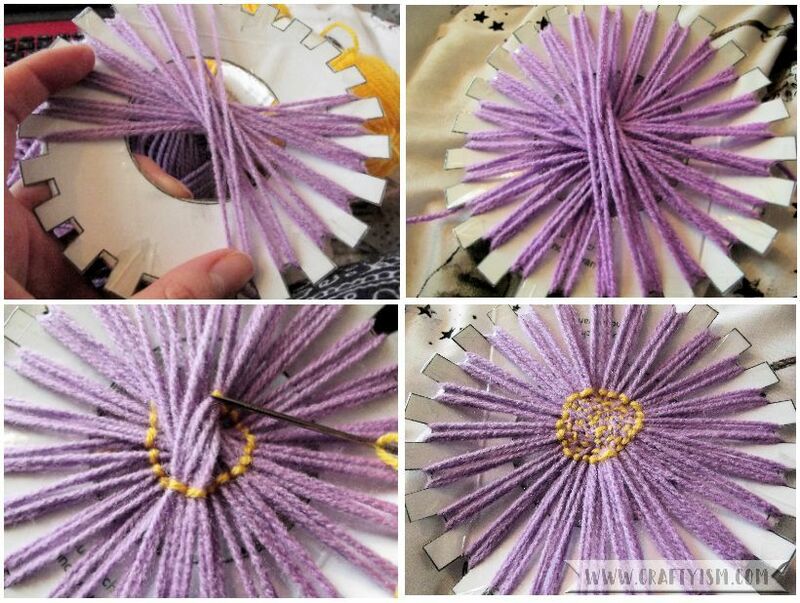 If you are a beginner like me, definitely read the Before You Begin section as it explains what a flower loom is (a circular or square frame with pegs attached) and how to use it (weaving yarn around the pegs and joining it together in the middle). If you don’t want to commit to buying a loom, there are templates to cut out cardboard looms so that you can give making crochet flowers a go first. I loved the Flower Selector section, it’s very inspirational and makes it easy to choose what type of flower you want to make. The instructions for each flower are very clear and easy to follow and many of them don’t even require any knowledge at all of crochet. The main crochet part happens when joining the flowers together and making up your finished projects. 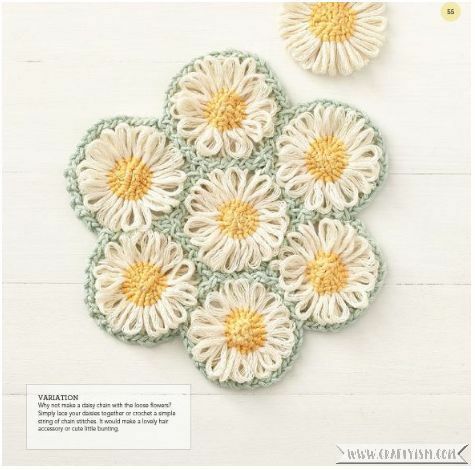 I liked this daisy flower loom design and it seems to be one of the more simple patterns. Using the template to make a cardboard flower loom from the back of the book, I decided to give it a go. 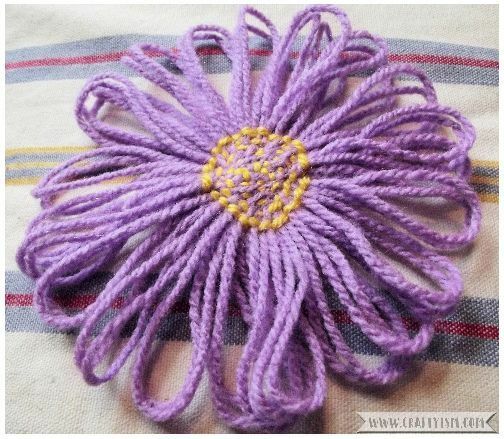 Following the easy to read instructions, I started weaving the daisy flower. It worked up really quickly and was surprisingly easy considering I was using a homemade cardboard loom! The Before You Begin section shows a number of methods for joining the yarn and creating the centre of the flower. For the daisy, a simple backstitch through the middle of the loom is used. Again this was really simple. The book also mentions that a sharp needle should be used as the centre section of yarn can get quite thick. I would agree with this and it did make it much easier to sew. Considering I had never heard of a flower loom before picking up Crochet Loom Blooms, I’m now so eager to make loads! They’re so quick and easy to make and I think they look really sweet. An individual flower would be a really nice last minute gift. You could attach a brooch or magnet to the back, or stick it to the front of a card. The finished larger projects in the back of Crochet Loom Blooms would be a great challenge or twist for confident crocheters who are looking for something a little different. I also like the idea of making a really big cardboard loom and creating a giant flower! I can imagine it being made into some sort of cushion for the garden. Perfect summer crafting! If you like the look of Crochet Loom Blooms, I think you’d also like Crochet Therapy by Betsan Corkhill. Let me know which flowers you would make with your flower loom and what you’d crochet them into!